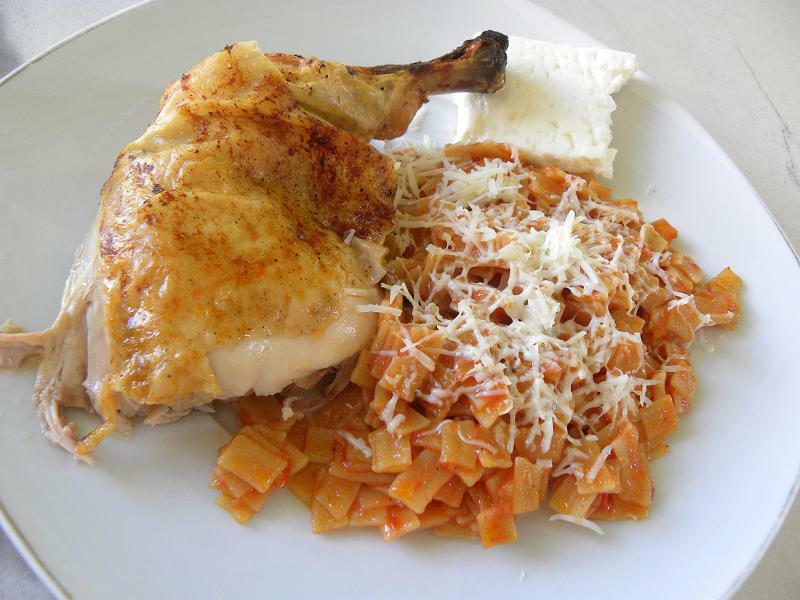 Kotopoulo me hilopites is a Greek dish with baked chicken in tomato sauce and then hylopites, egg noodles, are cooked in the sauce. If you cannot find hylopites see how you can make them yourselves or you can substitute hylopites with other egg pasta. I have lots of recipes I have gathered during all these months and for which I did not have the time to write about them. So instead of writing a lot of things I thought that it would be the time to write some of these recipes and have them in autopost for the period I shall be away. To make this simple dish not many ingredients are necessary. Greek cooking is based on simple but good quality ingredients. The chicken is baked whole, or cut into pieces, in the oven with the skin on, in a tomato sauce. When baked it is then removed and additional water is added, for the pasta to be cooked in the chicken-tomato sauce, which makes it extra delicious. Kotopoulo me hilopites means chicken baked with a traditional Greek egg pasta which can be found in long form, similar to tagliatelle or these are cut into little square pieces, like the ones I have used. Wash the chicken and season inside and out with salt, pepper and oregano. Put it in a baking tin, breast facing down and add the tomatoes. Add the olive oil, wine and bay leafs. Preheat oven t0 180 degrees C and roast the chicken for about one hour and fifteen minutes, turning once. When roasted, remove chicken to a platter and add the hot water. Bring to a boil and then add pasta. Stir a couple of times until the pasta is cooked (about 20 minutes) and if needed add more hot water. Serve, grating some Greek dried Myzithra, graviera, kefalotyri, halloumi or any other hard cheese on top. You can feed me “hilopites” forever! Something about them being home made that drives me crazy. I like them any way and they look great with the chicken Ivy. Delicious! We just had kota and hilopites on Sunday Ivy. One of our favorites. Yours looks delicious. I wonder if I can find this type of pasta here. I will be on the lookout for it Sis!! This looks really tasty. I bet it would be a fabulous weeknight dish. Do you think it would work with cut-up fresh lasagne noodles, if the proper pasta couldn’t be found? I made these little shapes out of fettuccine the other day and my four-year old loved them! Your mention of these three cheeses: Myzithra, kefalograviera, halloumi has me sooo curious. I would love to try these Greek cheeses one day! Hi my friends and thank you for your lovely comments. Fearless kitchen, I think it would work with any fresh pasta containing eggs. As Corinne said you can cut fettuccine into smaller pieces and make this dish. This I have to try..have to ..got to, must to …. It’s so interesting and I used to make my own pasta! Still have the machine stored in my cabinet. TIme to get that baby out from the hiding!! !